Nowadays, Our biggest problem is distraction. We all loves playing games, eating, watching tv, etc. But we wanted to focus in our career but problem is that we are distracted by these things and to control these things we watch inspirational videos or read books, quotes or blogs means we are just wasting our time. We are not recognising what kind of power is in our mind and how much we can increase our ability. Nice thought to be shared! There are two sides to life.. 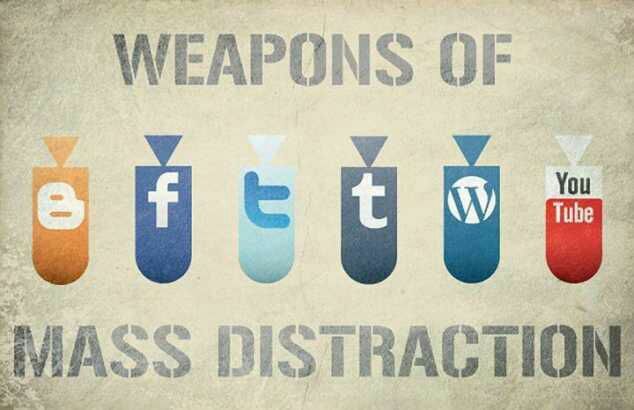 These are distractions if they are made priority.. Very nice, I like this post very much, this is so true of us all in today’s society. Have a great weekend! really love your illustration and advice here … we need to focus on our priorities and monitor these weapons of mass distraction! I dont know what to say, Rupesh. These sites may control you if you let them. I dont intend to distract people through my blog, as you do too (I like to think that way 🙂 ), everybody is free to do and act as they want.